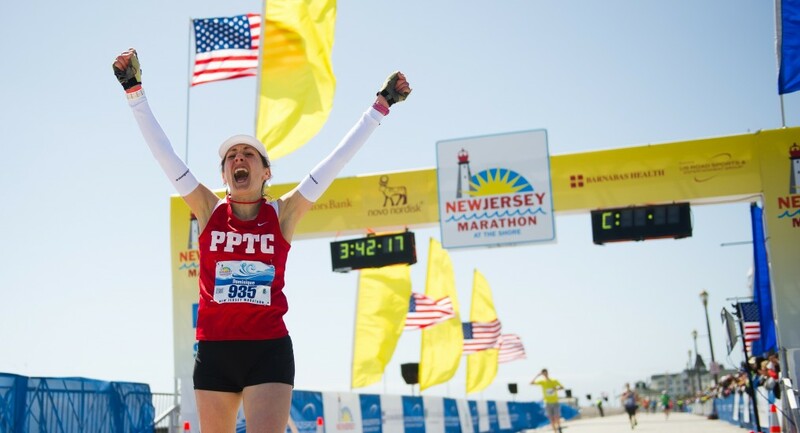 The New Jersey Marathon is proud to be involved with many local, regional and national charities. A complete list of these charities is posted on our website at: www.njmarathon.org. Please click on the “Community” tab on the menu to see list of the charities in each of our two programs; the Beneficiary Program, and the Charity Affiliate Program. We estimate that approximately $1.5 million will be raised by the charities during The New Jersey Marathon Weekend: The largest is Team in Training for the Leukemia & Lymphoma Society with over 300 athletes raising funds, volunteering and participating in our races each year. Watch for their purple shirts and singlets and their coaches along the courses. If you haven’t joined one of our charities already, there is still time. You can help by: joining a team and raising money on behalf of your favorite affiliated charity, sponsoring a runner who is already on a team, or volunteering your time with them during the weekend events on Friday and Saturday at the Novo Nordisk Health & Fitness Expo at Monmouth Park, and on Saturday morning at the Barnabas Health Family Festival and Kids Races on the Ocean Promenade in Long Branch. On Sunday, your supporters can join our Charity Beneficiaries at the start or finish lines, or on the course handing out water or keeping the course safe. Helping a charity is a wonderful way to add even more meaning to your race! We have continued to improve the expo experience again this year, and we’re excited to let you in on our planning! We have increased the number of vendor, local business and charity booths, and they are sold out already! In addition to the vendors, charities and local businesses which will be on our expo floor, and the Race Packet Pick-up service, we will soon be announcing a slate of speakers, exercise classes and also fun activities for kids. The speaker presentations will be geared to you, the endurance athlete, in order to help you train, race and recover better than ever before. Don’t miss these free sessions going on throughout the day. Check out the presentation schedule when planning your trip to the expo, or stick around and hear them all. I may provide a course preview and tips presentation, if time permits. Check the schedule, when posted, to find the ones which are most interesting. In addition to the speakers, we will be announcing a number of free activities on Friday (including high energy classes), and on Saturday equally beneficial, and less taxing classes (i.e., Yoga, Qigong, etc.). All the events are free and open to the public. Also on Friday and Saturday afternoons there will be free fun for kids. Balloon twisting, face painting and other activities will be in various places throughout the park (weather permitting). Bring the kids of all ages! In addition to all of the above, the Kentucky Derby will be held late Saturday afternoon, and Monmouth Park will be full of mint juleps and ladies in large hats, at least on the Clubhouse side! There will be two pari-mutuel betting windows open at the expo, and you will also have free admission to the Clubhouse, where you can eat, wager and watch the races on the large screens. Prior to race day, we will be sending every registered participant an important message, via the email address which they entered during registration. This email will contain the Registration Confirmation and Waiver Form. Please verify the registration information for accuracy, and note your bib # assignment. Important – YOU, OR YOUR PROXY, WILL NEED 1) THIS SIGNED ORIGINAL DOCUMENT, AND 2) YOUR VALID GOVERNMENT ISSUED PHOTO ID (or a copy of the Valid type of ID if by proxy), to pick up your race packet. Details are available at: “Packet Pickup Info”. Please note: There will be two mailings of the Registration Confirmation and Waiver Form. The first mailing will be sent to everyone registered by April 7th. For those registered after the 7th, the mailing will be sent a few days after the close of on-line registration (which will be no later than the end of April 29th and could be earlier if we sell out prior to that date. Move for Hunger will be conducting a food drive during our entire weekend. Please come to the expo with “cans in hands” to help make a positive impact on hunger, right here in The Garden State!!! We are also attempting to change the lives of poor families forever by providing them sustainable resources. We need your help again this year in donating used athletic shoes to The MORE Foundation during the expo. It takes 600 pairs of shoes to adopt a family, and we’d like to adopt several this year! Please join us in this very worth-while effort! We are well on our way with 300 pairs already collected. Mark your calendar for another New Jersey Marathon sponsored tune-up training run on Sunday, April 14 (three weeks prior to race day). We will have a 10 miler (8 AM start) or 20 miler (7 AM start) “Last Long Training Run”, on parts of the course. Please “Join” our event on Facebook, no later than on Friday the 12th, at: http://www.facebook.com/events/344701218979083/ . We need a headcount to finalize our planning, so please let us know that you’ll be training with us on that day by clicking on “Join” for the event. Please note: clicking “Like” will not register you for the training run. Please see Correction # 3 below for 10 miler start times. Email us your stories! We recently had a number of important, helpful, inspiring, moving responses to one of our posts on Facebook. We would like to know more about why you run and how it has changed your life or helped you in some way. We will compile them all and publish them over the coming weeks and months. Please note: you may be featured on our Facebook page, in newsletters, or promotional materials if you submit a story to us. Running has done so much good for so many, it’s time we shared those stories and exposed the courage we hear about so often from you. You inspire us every time we are lucky enough to come across them. Many people think endurance runners are super healthy people and are not like everyone else. Your stories show that people who are dealing with issues which so many others find difficult or impossible are doing extraordinary things. 1) Jet Blackberry GU 2X caffeine and Vanilla Bean GU with caffeine will be the flavors on the full marathon course. It was previously posted as Chocolate Outrage and Vanilla Bean. 2) A version of Race Director Update #6, in the archive on our website, was incorrect regarding the fee for the Special NJ Marathon Train. This train will require pre-registration and pre-purchase of a $10 ticket. 3) The start time for the 10 miler training run on April 14th is listed as 7:30 am on our Facebook Event listing and as 8:00 am in my RD Update # 5. I will start 10 milers at both 7:30 and again at 8:00. You are free to start at either 7:30 am or at 8:00 am. All 20 milers will start at 7:00 am as posted. ← Have a question about planning for race weekend or an ache, pain, strain, injury, etc.? Let’s talk! I registered for the marathon (my first-yea!) back in January but haven’t received the registration confirmation and my bib # yet. Is there a delay in aforementioned April 7th email date? Just want to make sure I didn’t overlook anything. Julie – the emails will not be sent until at least next week. They will go to everyone who was registered by that date. I was trying to let everyone know that the first batch of emails would include only those registered by the cutoff date, not that they would be sent out on that date. Sorry for the confusion! Look forward to receiving the email, and most importantly, running the marathon. Just a quick note to let you know I read the New York Times article about the half and marathon. The fact that you have been able to coordinate this massive effort so efficiently, despite being displaced yourself is a real testament to you and your team. And that EVERY town cooperated is further evidence of what an awesome person you are…a true example of Jersey Strong! Thanks, Joe! Did 21.2 today. Can’t wait for May 5th! Huge thanks to you and your entire team!